This is a photo given to all of us kids that starred !!!!!!! 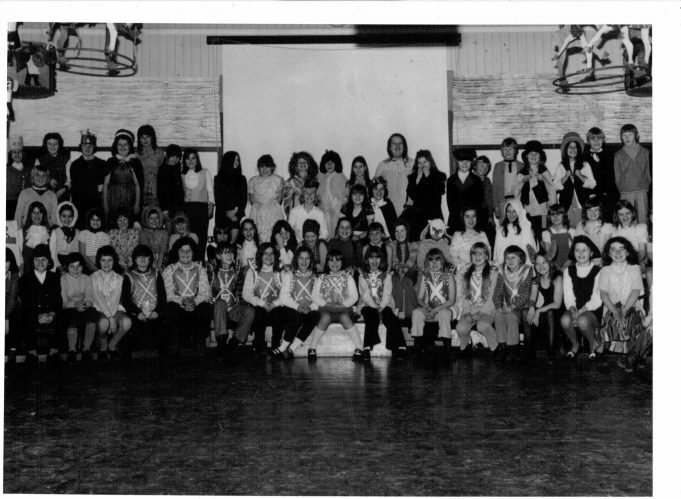 in the epic school play called “Cinderella or thereabouts” which I think was around 1972 ish – the Thurrock Gazette covered this – I am in the first row front fifth from the left ! Does anyone recognise themselves or other classmates ? That’s me bottom left playing a police sergeant. David Jones was my constable lol. Ah yes I see Jamie around Asda from time to time, that’s great about him being a grandad ! I believe he lived in Byron Gardens ? I am a grandad also, little lad Mickey 4 years and another on the way !! Please give Jamie my best regards. I remember you Stephen. Jaimie still lives in Tilbury he is a Grandad now. Yes you are absolutely spot on, that is Jamie, I recall that he used to live in Feenan highway and i once bought a couple of budgies from him !